Today I had promised myself that I won’t go ahead with my ramblings, so all the regular visitors of my Virtual Kitchen, can simply heave a sigh of relief ! But hold on……..promises are meant to be broken isn’t it? Well, I wont budge without talking about the Earth Hour, that was observed on 28th March, all around the globe.The question is did we participated and put off the lights for an hour? Nopes…the reason is we already did that for 6 hours during the day and do so religiously everyday, Thanks to the daily “loadshedding”. But the earth hour did made me sit and think about, how wonderful it would be, if all the residential areas (and not industrial ones) in Maharashtra at least, switched off the lights for an hour daily, then obviously we wont have to suffer the daily torture of six-hours-no-electricity…….Any one listening??? Now coming to Dal puri,which is one of the most common breakfast amongst Sindhis.Now all those health conscious people, before you frown upon me, let me assure you that the deep fried puris can be replaced with plain roti, koki, even bread ,but then few combinations are made in heaven.And Dal puri is one such awesome combination. Take a very small portion of this dough and roll it into small chapati. Boil it in a pressure cooker with some salt,water and turmeric powder,untill two whistles of cooker. It can be cooked in a pan or Handi too, the cooking time will be anywhere around 15-25 minutes depending upon the quality of dal and soaking time. Garnish it with black pepper powder.Optionally one can add the tempering of red chilly powder+garam masala powder+coriander powder, ¼ tsp of each,before serving. Another option is to heat up a charcoal piece, place a small steel katori in handi/ cooker containing dal, add a tsp of ghee over the charcoal and immediately cover the pan or cooker with a lid so that the smoke get trapped inside the container. This imparts a lovely smoky flavour to dal. Hi, just read the recipe for Dal Makhani (or Badhi dal) as we call it, looks good. 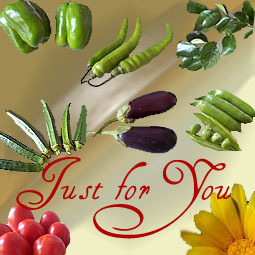 We usually add mixture of Amchur, Red chilli pd, dhania pd. on top and a tablespoon of hot oil to temper the masala. Tastes yum too! so simple yet so divine,.. I love this! Abs. yummy food. 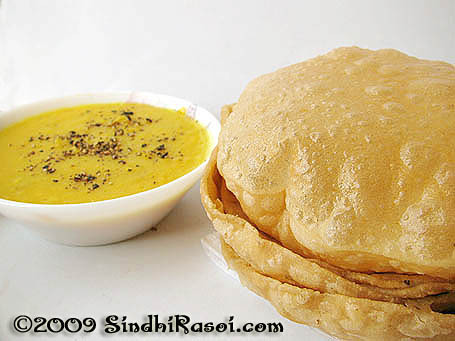 Puris look awsome.. I love them with toor dal.. Have to try with moong though.. This daal puri takes me back in time too.. to Sundays when this would be a specility deserving of a weekend morning..oooh it’s been so long I had this..
Nice to meet a fellow Sindhi & shall keep dropping by..
those puris and dal look fantastic, dear alka. maybe you should develop some recipes for chutneys, etc. that don’t need a blender or electrical appliances so that people with power cuts don’t have to go without cooking. Thanks Alka for visiting Krishnaarpanam. 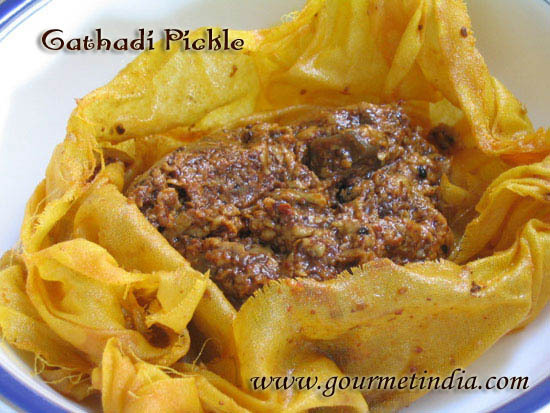 I am a secret visitor of your site and love all the recipes that you share specially the Dal-pakwan. Thanks for the lovely recipes. Wow….thats such an easy recipe for dal. The puris look wonderful! 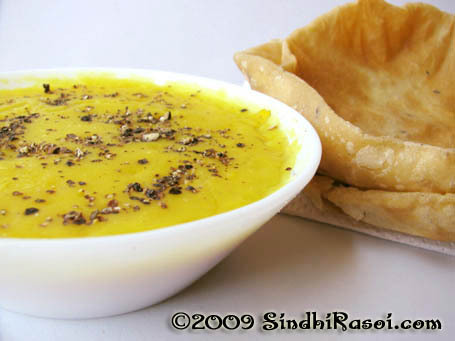 Dhal is all my time fav though not yet tasted with pooris….Clicks are cool! How simple and how perfectly delicious. This is comfort food at its best, Alka. that looks totally comforting 🙂 i’ve never had dal with puris.it is always aalu or channa masala. will try this combi. Poori is our all time favorite and that said it has been a while since I made it. This combination is simple yet comforting, glorious way to end a long day. Wow that’s luk yummy….Honestly I find Sindhis fond of Mung daal. WE have so many recipes for this daal….Loved ur blog and of course receives. a goog picture and an a commendable effort to take it as well. I was hoping you give us beh ja pakora (although I guess its a winter snack). The dish looks quite tempting and with very less ingredients ,makes it more special. My husband loves to eat food with no onion and garlic,and ur dish helps me a lot. Thanks. lovely read. Awesome pictures. I love the combo. I have nearly stopped making deep fried recipe at home 🙁 reading ur post I am tempted to make to them once in a while. Lovely blog! All the best! Wow that looks so delish and perfect. It brings back lots of memories.. Can have poori any time..
Alka, you are entitled to the cribbing but you know what, unless you drive a car everywhere, Indians (by that mean living in India) have the least carbon foot print compared to the developed world. And an indulgence once in a while is never wrong and yours is actually quite a nutritious meal with that delicious protein filled dal. Wow wish i could brab the dal and the puri. Thats a very simple recipe yet very tasty! Nice click Alka! Dal puri reminded me of my childhood and my mother who used to serve us sindhi makhni dal with garam garam puris, god where are those days and where are those lovely people. World and time is completley changed. Dal Puri (new combination for me) looks appetizing; love the freshly ground pepper on the dal looks delicious with the perfectly puffed puris! The distribution of power (whichever meaning we choose) is really unfair in the world. A few countries suffer from load shedding cuts, while a few others take electricity for granted. Its the awareness that is lacking in most cases…hmph! The poori and dal look sooo yummy, lovely pics too Alka. I wish I could have some right now.. Loved you Earth Hour blog and thank you for the Dal Puri recepe. I am trying it for this weekend breakfast. My younger daughter is a strict vegetarian so I have to find ways and means of making her eat protiens. Dal Puri looks yum, dal is simple yet flavorful. Glad you are like me, one of those who is not afraid to fry at least once a week or once in 2 weeks!